DRE have been manufacturing and supplying Drum Grabs for over 20 years. The Barrel Grabs are manufactured at our workshop situated in Bunclody Co. Wexford Ireland, at the Wexford, Wicklow and Carlow borders. DRE have being manufacturing and supplying drum grabs in Ireland for over 20 years. 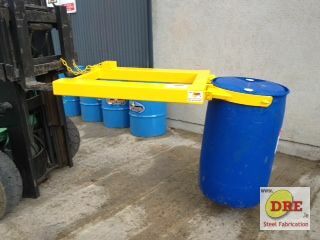 The DRE drum lifter to be used with 210 litre steel drums. Offers a quick efficient and cost effective means of transporting plastic & steel drums, drums can be loaded and unloaded safely and transported with out any manual handling. Grips the drum firmly using a centre clamp. Perfect for transporting drums.